Q: Do they come with cords? What is the length of the cord? A: Terra Cotta Pendants/Car Diffusers come with a black waxed cotton, sliding-knot cord which can be adjusted in length to approximately 38 cm (15 inches) to 76 cm (30 inches) long. Also include is a short black stretchy cord with can be used to convert the pendant into a car diffuser or a hanging ornament. Q: How do I adjust the length of the cord? A: See a video about this here. 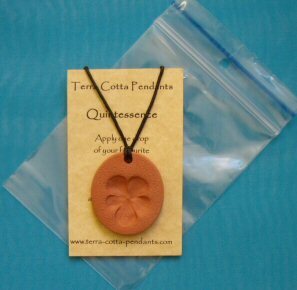 Q: How are Terra Cotta Pendants / Car Diffusers packaged? 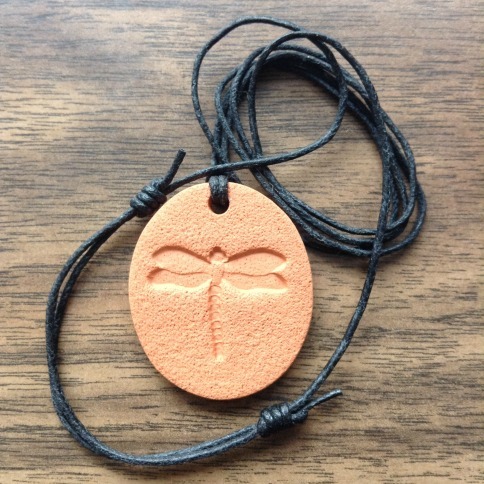 A: Terra Cotta Pendants/Car diffusers are packaged in the form of a pendant with the long black adjustable cotton cord attached to the terracotta . Also included in the bag is a shorter black stretchy cord witch can be used to convert the pendant into a car diffuser or hanging ornament. Items are neatly displayed inside a small (3 x 4 1/2 in ) clear zip-lock bag along with a description card. 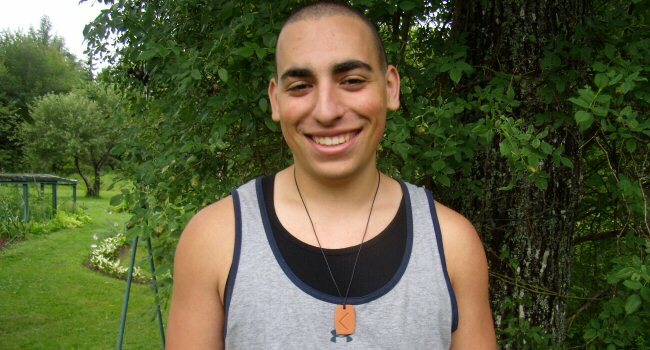 Q: What are the sizes of the Pendants/ Car Diffusers and Bracelets? A: Round Pendants – 2.8cm (1 1/8in) across with the exception of the 5 calligraphy designs in the “Words” category which are 2.9 cm across (1 1/8 in); Oval Pendants – 3.25cm by 3.75cm (1 1/4in by 1 1/2in); Rectangular Pendants – 2.7cm by 4.2cm (1 1/8in by 1 7/8in). 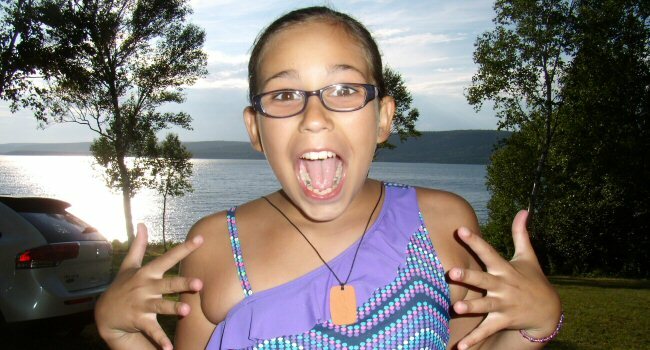 The Arrow Wrap Bracelet – clay piece measures 1 1/2 inches by 3/4 inch / 3 8/7 cm by 2 cm. The cord is 64 inches / 158 cm long. 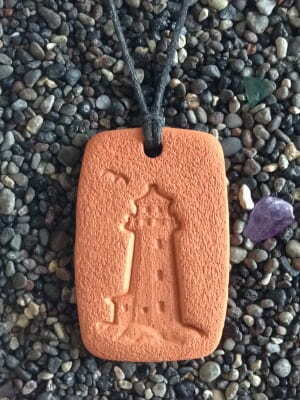 Q: How thick are Terra Cotta Pendants / Car Diffusers? 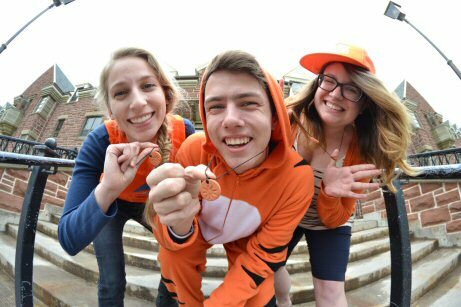 Q: What are the weights of the Pendants / Car Diffusers? A: The Heart designs weigh 7 grams; the Oval ones (like the Dolphin) weigh 10 grams; the rectangular ones like “Kokopelli” weigh 12 grams; the small round ones, like the Elements weigh 7 grams. 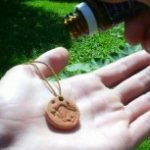 Q: What is the difference between Terra Cotta Pendants/Car Diffuser and DIY necklace diffusers? A: That question is answered here. 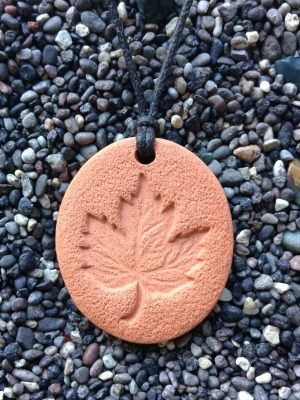 Q: Are Terra Cotta Pendants/Car diffusers breakable? 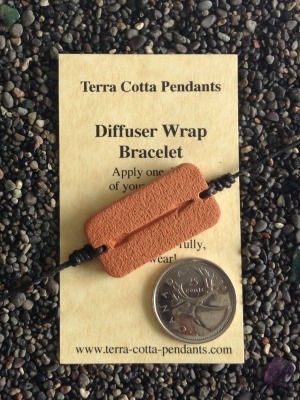 Q: Can you wear a Terra Cotta Pendant/Car Diffuser in the shower or whilst swimming? A: You can but that would saturate the clay with soapy water and you’d have to rinse and let it dry out completely before it could absorb essential oils effectively again. Swimming in salt water would clog the pores and leave a white salt residue on the surface of the terracotta . Much fresh water rinsing would be required to flush the salt out. A: A couple drops. See more on this here. A: No. A couple drops will diffuse for several days. When you can no longer smell the oil as well as you’d like, you can reapply once more. A: Lay the pendant flat and let drip a couple drops over the design impression . Allow the oil to fully absorb into the terracotta before wearing. This page explains more. 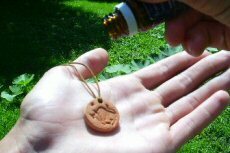 A: No, as long as it is completely absorbed in the terracotta before you put the pendant on.After applying the oil whait two to three minutes and when the pendant is dry to the touch; it is good to go. Q: How can I change the oil that I’m using? A: Wait until most of the oil has diffused off the pendant.This could take several days. You can speed this up a bit by placing the pendant in a warm dry place with lots of fresh air circulating around it. You could try placing it inside your car or outside on a sunny day. Some oils will blend nicely so that you can apply a second oil when there is still some of the first oil remaining on the pendant. 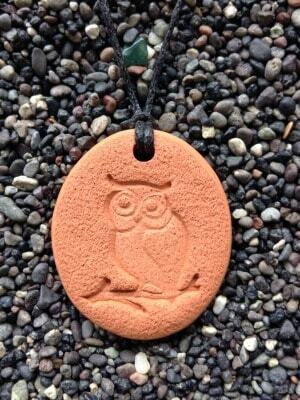 Q: How do I clean my Terra Cotta Pendant if it becomes saturated or soiled? A: You can clean it following the instructions here. Q: Don’t I need to use heat to diffuse the essential oil? A: Essential oils are naturally volatile (“evaporating quickly and easily at ordinary temperatures”) so you don’t need heat to diffuse them. However when you ware a Terra Cotta Pendant your body heat will act as a heat source and warm up the oil thereby accelerating the diffusion process. Also, since hot air rises , it will automatically rise up directly under your nose and carry along with it the essential oil fragrance you’re diffusing of your pendant. Q: I would like to purchase at a wholesale price. What do I do? A: Simply add 20 or more pendants/car diffusers to the Cart. When you add the 20th unit, the wholesale (50% off) discount will apply to the total. For more details go here. Q: I just want to purchase a lot of them as gifts. May I have the wholesale discount? A: Yes, refer to this page. Q: Why are there so many different prices? A: There is a good (and detailed) explanation for that. See it here. Q: The prices are in Canadian dollars. How do I know what it will cost me in another currency? A: The total amount of your order will be converted when your credit card company processes the transaction. 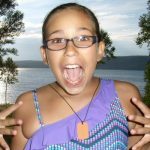 Try a currency converter on this page. Note: this may not be exactly the exchange rate your credit card company will give you. A: You can see the shipping costs in two ways: place items in the shopping cart and fill in your address or go to this page. A: We provide two payment methods: 1) select “Credit Card” at the bottom of the checkout page and there you can use Visa or MasterCard. OR 2) select “PayPal” from the drop down box at the bottom of the checkout page and check out with PayPal. There you can use Visa or MasterCard. Or you can select PayPal and there you can use your PayPal account, or check out as a Guest and use Visa, MasterCard, Discover or American Express. Note: our Cart won’t take Debit cards. Q: Do you ship to a PO Box? Q: Do I pay any taxes? A: Not unless you are in Canada. Q: Do I have to create a Customer Account to order? A: No, but if you think you might like to order again in the future, create a free Customer Account in the Checkout. Don’t worry, the site does not store your credit card — just your name and mailing address. 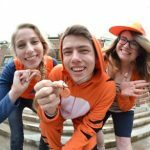 Q: Do I have to become an Affiliate to place a wholesale order? 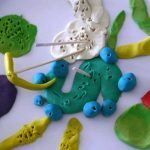 A: No, the Affiliate program is for people who have websites where they want to promote Terra Cotta Pendants and receive commissions on the orders that come through their link. To see more about the Affiliate program go here and here. Anyone can place a wholesale order as long as they are ordering twenty pieces or more. See details about that here. Q: I am an Affiliate. 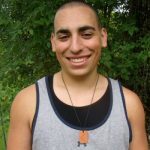 Do I log in with my Affiliate credentials when I order? A: No, sorry – they are two completely different things. You only use your Affiliate credentials when you log into your affiliate account to check stats. When you place an order use your Customer Account to checkout. The links for both the customer account and the affiliate account are at the bottom of each page of the site. Q: I use my own carrier for shipping. Can I arrange for pick-up at your location? A: No. Our policy is to ship all product ourselves. If you require a faster shipping rate, ask us about it. If you don’t see your question answered here, click here and we’ll be happy to assist you.